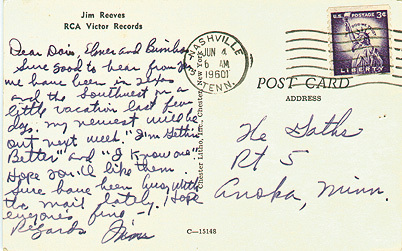 This postcard is one of the many letters and cards that were sent by Jim over the years to the Gath family. This one he addresses to Doris and her husband Elmer, as well as "Bimbo" -- a cute reference to their little boy Eldon, who liked the song. Thoughtful, handwritten letters to his close fans are a hallmark of how Jim related to his admirers. This private exchange clearly contradicts assertions by some that Jim was rude to people or didn't care about fans! Why do you think they called him "Gentleman Jim"?